Thank you for a great Japan tour. arigato gozaimasu. 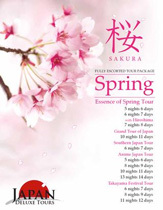 I would highly recommend Japan Deluxe Tours to anyone looking to travel to Japan. Thank you for educating me about my homeland through a great Japan tour. arigato gozaimasu. Enjoyed having one night Japanese room. I wish I had tried the Onsen bath. Rooms were comfortable, bidet was a new sensation! Nice variety of regional foods. Very large meals. I loved having the Japanese breakfast and will miss it when I go home. Least favorite meal was the Nagasaki Champon nodules. Hide-san was very knowledgeable about his country, shared tidbits about the local cultures. Presented information with a sense of humor. Japanology video filled in the long bus rides. Hide was very thoughtful guide announced many additional information. These were the popular places that we wanted to see without the hassle of planning it ourselves.